Sanjay Nag, Prof. Samir Kumar Bandyopadhyay and Nabanita Basu. "Detecting Items Hidden Inside a Body." Journal 4 Research 1.12 (2016): 1-6. Naveen Gaurav, A. P. Singh, Arun Kumar, Aviral Maithani and Aditi Grover. "Effect of Supplementing Mixture of Benzene Amino purine (BAP) and Kinetin (KN) Along with Auxin 2,4 D On Growth Of Callus In Murashige And Skoog Medium Derived From Embryonic Cotyledon Explants of Withania Somnifera L." Journal 4 Research 1.12 (2016): 7-11. Dr. Mamta Alok Mishra and Tapan Patel. "Understanding Consumers- Online Purchasing Behaviours in Pune City." Journal 4 Research 1.12 (2016): 12-17. Smeeta C. Maheriya and Priyam A. Parikh. "A review :Modelling of Brushed DC motor and Various type of control methods." Journal 4 Research 1.12 (2016): 18-23. Ravita Chahar and Ashma Chawla. "Search Engine Optimization: An Illustrious Approach for Web Based Marketing in the Era of Globalization ." Journal 4 Research 1.12 (2016): 29-36. Dr. Prasana Kumar Mishra and Dipty Rani Dhal. "Expected Number of Level Crossings of a Random Trigonometric Polynomial ." 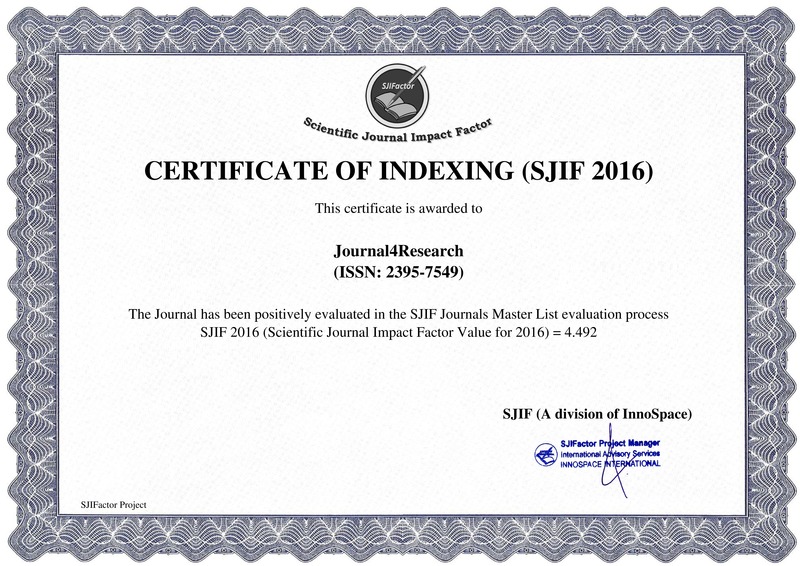 Journal 4 Research 1.12 (2016): 37-40. Dimple J. Vora and Vandana V. Patel. "Modelling and Simulation of Inverted Pendulum using Internal Model Control." Journal 4 Research 1.12 (2016): 41-45. Prof.(Dr.) P. A. Khatwani and Prof. K. S. Desai. "A Review of Detection of Structural Variability in Textiles using Image Processing and Computer Vision." Journal 4 Research 1.12 (2016): 46-50. Shuchiket Darunde, Pratik Alone, Ketan Kitukle, Santosh Jadhav and Prof. Diwakar Korasane. "Electrical Power Generation by Non Conventional Energy-Geothermal." Journal 4 Research 1.12 (2016): 51-54. Dr. Maurvi Vasavada and Yash Padhiyar. ""Smart Tourism": Growth for Tomorrow." Journal 4 Research 1.12 (2016): 55-61.